Chris is a student at the University of Albany in New York and an outdoor activities enthusiast. He enjoys spending time with his two dogs, and likes to play soccer and tennis. His favorite foods are plain chocolate and raspberries. 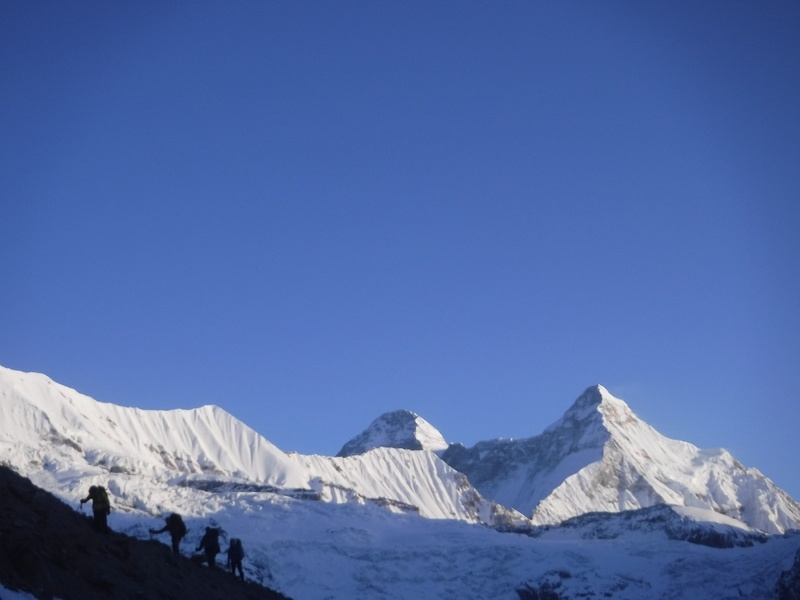 Students en route to Camp 1 on a cold, clear morning, with Nanda Devi (middle) and Nanda Devi East (right) in the background. Photo by Chris Pouch. Nanda Devi, according to the legend of villagers in the Garhwal and Kumaon regions of India, was a beautiful princess. When a prince fell in love with her and asked to marry her, she refused, sending him into a rage. The prince declared war and forced Nanda Devi to flee to the mountains. She climbed to the heights of a snow-covered peak in search of refuge. When she could go no higher, she rested, looking down from the top of the world. This summit proved to be her final resting place as she merged with the mountain, leaving behind only her spirit, present in the wind and snow, and her name, which now belongs to the place that took her: Nanda Devi.